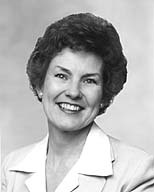 “Accepting responsibility, even when I had no idea how I could do it, and then trying hard to learn what the Lord would have me do﻿—this is what has prepared me,” said Barbara Ann Woodhead Winder, sustained on 7 April 1984 as eleventh general president of the Relief Society. Indeed, a pattern of continual striving to serve the Lord has marked Sister Winder’s life. An early example was a calling as assistant Sunday School chorister. “I had had no musical training whatsoever,” she recalls, “and it was a very painful experience.” With time and persistence, however, she was able to teach herself basic music and was later able to serve in a stake Primary music calling. Her first Relief Society experience, too, was with music. Sister Winder grew up in the East Millcreek area of the Salt Lake Valley and attended the University of Utah for several years before her marriage. But her understanding of people and the problems of the world has broadened with her travels during five years on the Relief Society General Board, as well as with the opportunity to serve people of many cultures in the San Diego Mission. Richard Winder sees his wife’s ability to draw others to her through her warm nature as an asset in her new calling. “Wherever we go,” he observes, “people seem to feel an immediate closeness with her.” “It has always been a privilege to support Richard,” smiles Sister Winder, “as a bishop, stake president, or temple sealer. But our mission call has probably been our sweetest experience, because we have worked so closely together.” The mutual support will continue, says President Winder, although the mission will end as soon as they can be replaced. The Winder’s four children﻿—Richard, Jr. (and wife, Debi Buchanan), Susan (and husband, John Tanner), George (and wife, Nancy Parker), and Robert have also been a great source of support. All four, along with the Winder’s nine grandchildren, live in the Salt Lake area. In typical fashion, the family has rallied together in love and unity at their mother’s new call. Sister Winder calls those just released from the presidency and the general board “my great teachers.” Sister Barbara Bradshaw Smith served as president for almost ten years, traveling throughout the world to teach, inspire, and advance the cause of Relief Society. Sister Marian R. Boyer had served as her first counselor since November 1978, and Sister Ann S. Reese as second counselor since October 1983. A lifetime of service has prepared Sister Barbara Winder to lead the women of the Church in this great purpose.